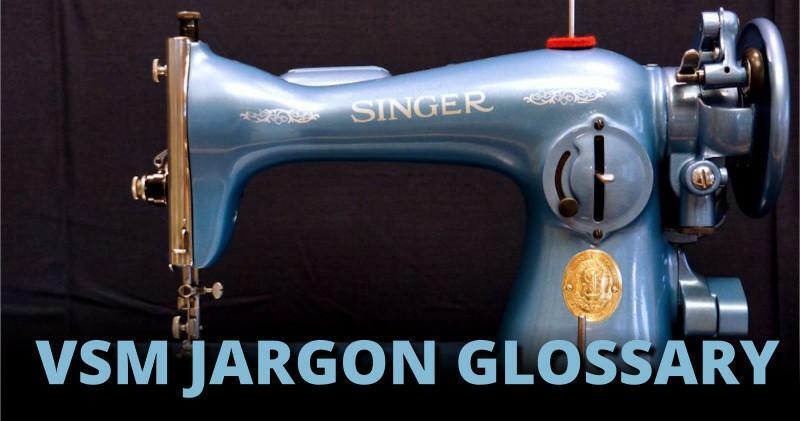 Vintage sewing machine collectors have their own jargon. This article will help new enthusiasts to pick up quickly on VSM lingo. 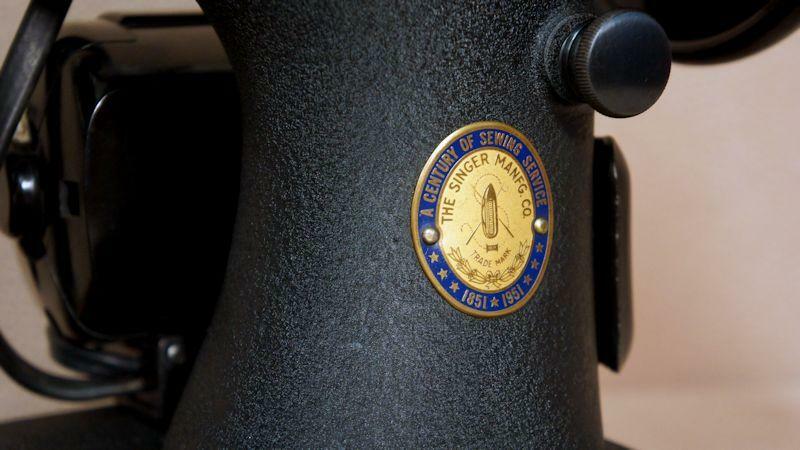 Badge has two important meanings among VSM (vintage sewing machine) collectors. The oval brass medallions common to Singers are certainly one type of badge. Some collectors like these to be polished to a shine, and others prefer them to remain somewhat dull, proudly displaying the long-term impact of time. There are special badges that Singer used to designate special years and events, like their Centennial medallion. Be careful if your badge has color in the border or design - some polishes and cleaning agents can strip away that color, and you won't be able to recover that original appearance easily - can you imagine hand-painting the Centennial badge pictured below to replace the blue color? One of the safest techniques to clean your brass Singer badges is to use baking soda and distilled vinegar as a paste on a toothbrush, scrubbing the badge gently and wiping away the excess fluid as you work. A second and larger definition of "badge" often relates to Japanese-manufactured machines. Following the devastation of World War II, Japan began producing sewing machines in staggering amounts as they rebuilt their industry and economy. 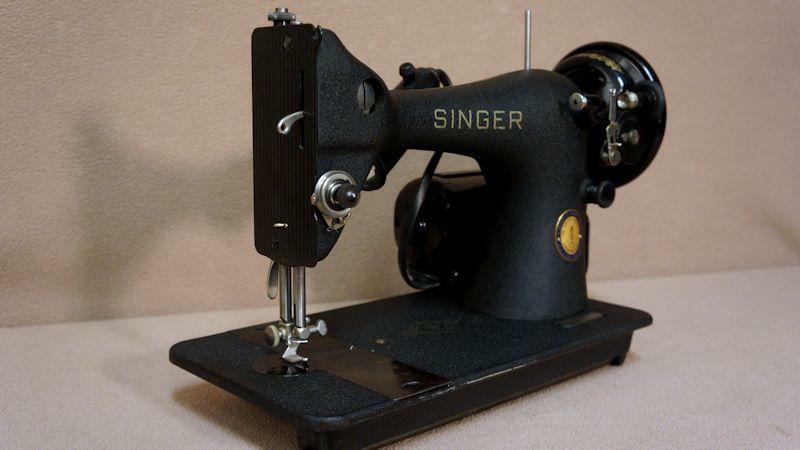 Early models were based on the Singer 15, but Japanese engineering soon brought innovation beyond straight-stitch machines. "Made in Japan" was a mark of quality at that time. 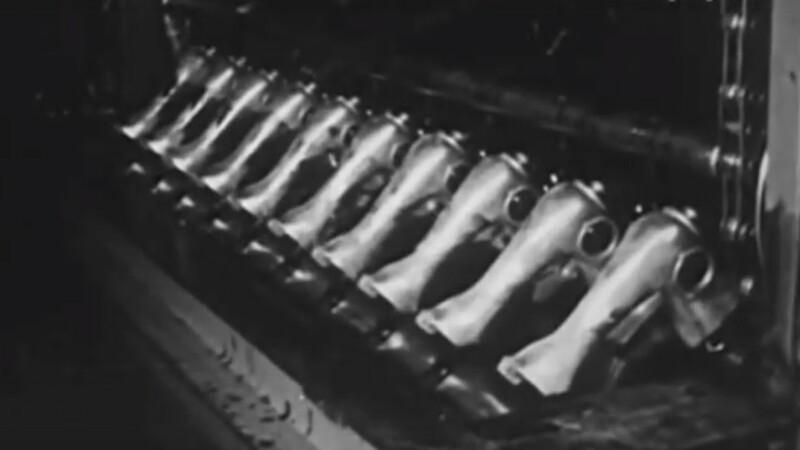 Some believe that Japanese machines based on the Singer 15 were actually better engineered than the American-built predecessor. Japanese production took design queues from Western trends and styled the machines in bold colors, chrome, and often retro-futuristic dials and buttons - much like American cars of the 1950s. These machines were then "badged" with different brand names, often per orders from American department stores and distributors. "The practice of badging was in place by the 1890s," collector Anne Kusilek reminds us, "long before the influx of Japanese machines. I collect Nationals and there are over 1000 known badge names for Nationals alone. In fact, the National Two Spool [featured later in this article] was sold under the name Eldredge as well as several other names." 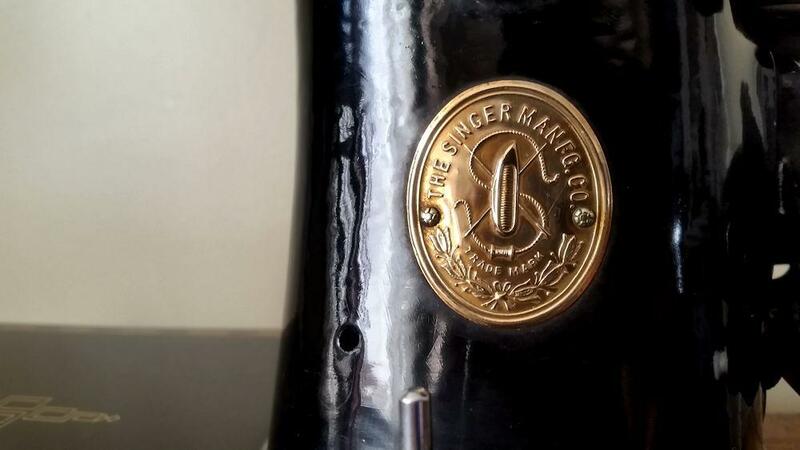 Originating in 1907, bakelite was an early form of plastic used to make a myriad of household and industrial items, including those familiar brown and black pedals and light assemblies on our vintage Singers. Bakelite does not conduct electricity and is heat resistant - perfect for some sewing machine components. To shine your bakelite items, try some light cleaning and polishing compound as used for automobile finishes. 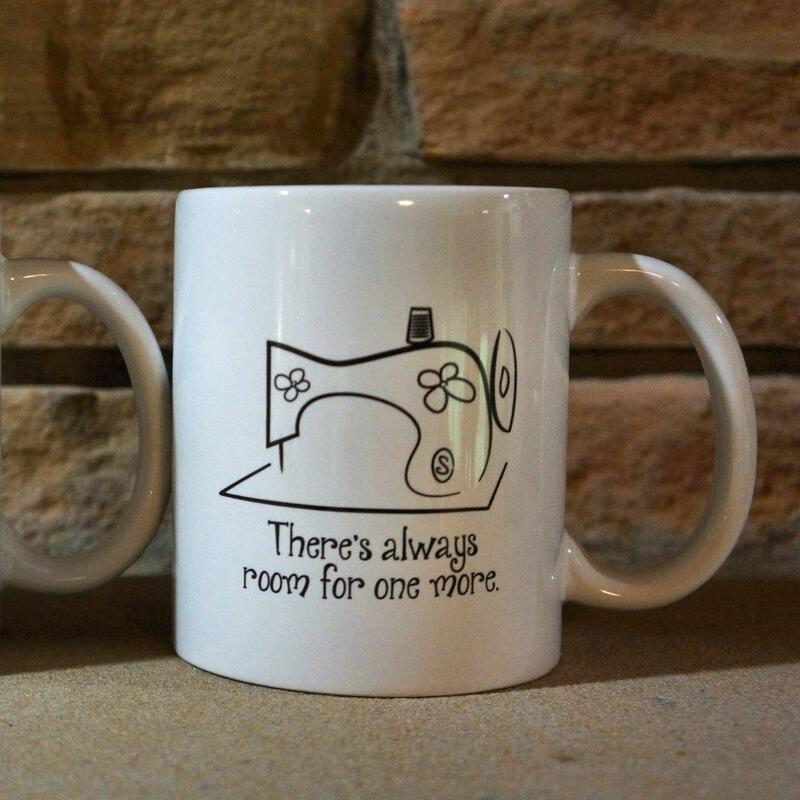 At least one sewing machine is commonly referred to as a "big sister." 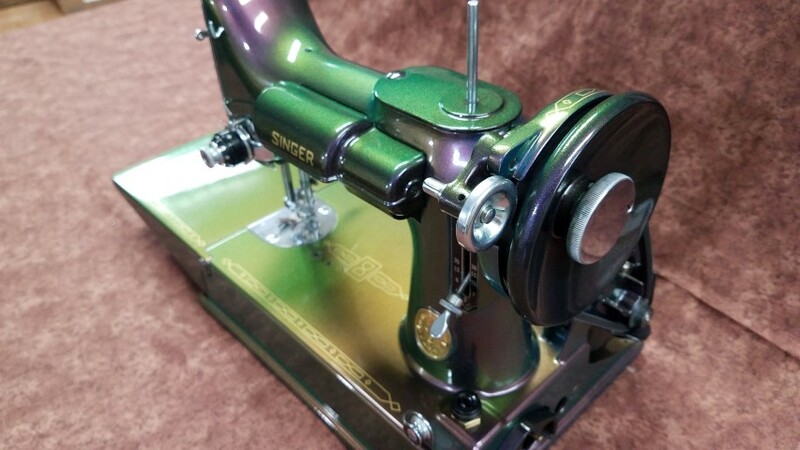 The aluminum-bodied Singer 301 (relatively light with a flip up handle on top of the machine) shares a bobbin case with the even smaller, lighter Singer 221/222 Featherweight. This "big sister" to the Featherweight also features a flip-up bed (both a long and a short model), similar to the flip-up bed on the Featherweight. Blackside and "Crinkle Finish" or "Godzilla Finish" are sometimes confused. Godzilla finish will be discussed later. 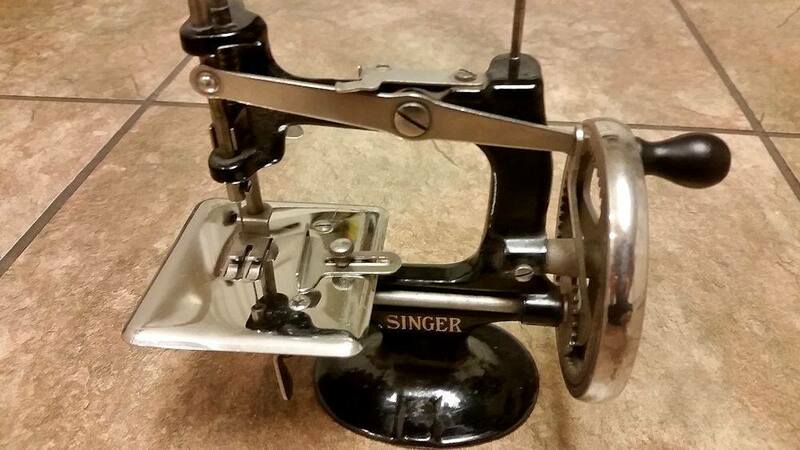 Throughout the 1940s and early 1950s, Singer sometimes manufactured needle plates, bobbin covers, face plates and some other components with a black finish rather than the shiny chrome appearance. "Blackside" refers to these blackened metal parts. It is typical that machines do not have all the normally bright metal replaced with blackside - many parts remain as polished nickel or chrome. 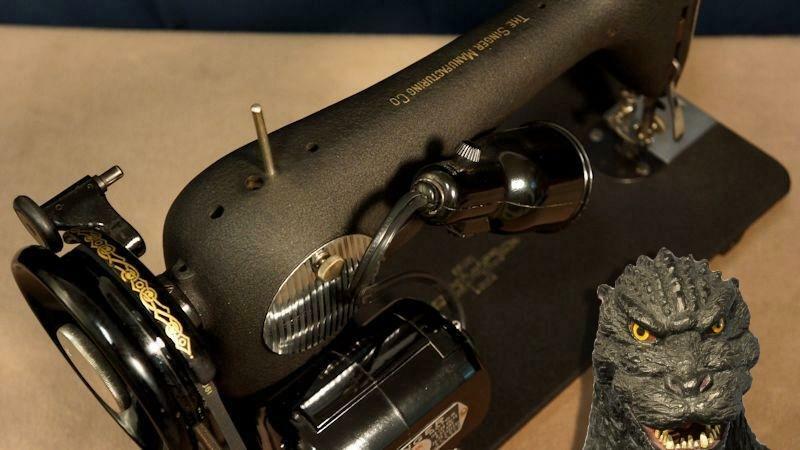 It is also typical that blackside components are found on machines with a crinkle or "Godzilla" finish, defined later in this article. Boiled linseed oil. In the VSM community, this product is closely associated with a technique for refurbishing the glossy black finish on classic machines. 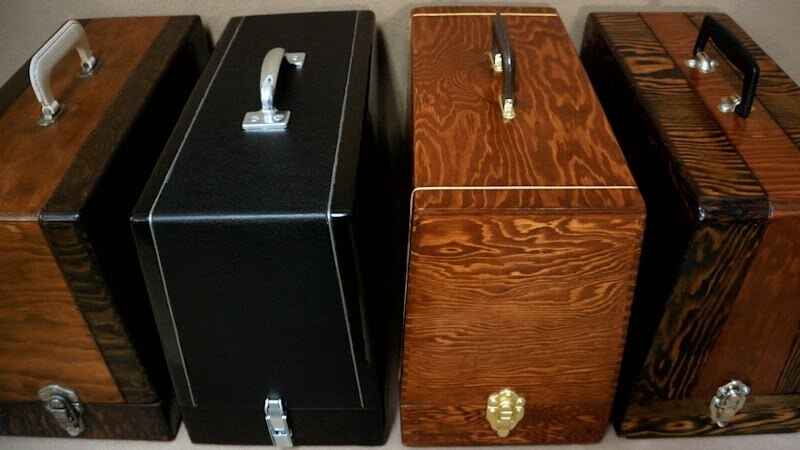 French polishing is a furniture restoration technique that requires BLO and can be used to refresh the finish on your classic black machines. The technique also requires denatured alcohol and shellac. A boat shuttle refers to either a transverse shuttle system or a vibrating shuttle, with the "boat" term referring more specifically to the shape and functionality of the bobbin case - it is arguably boat-shaped, and is hollowed in such a way that the bobbin inside is sort of "riding" within the "boat." Refer to Bullet and Dumbell, Reciprocating Shuttle, Transverse Shuttle, and Vibrating Shuttle within this glossary. The bobbin case and bobbin on Singer vibrating shuttle models are sometimes referred to informally as a "bullet" and "dumbell," due to their appearance. 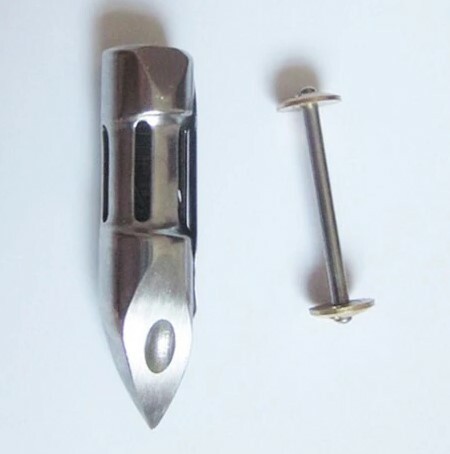 The "bullet" has a sharp point on the tip that serves as the hook. This bobbin is also termed a "boat." Refer to "Vibrating Shuttle" later in this glossary. 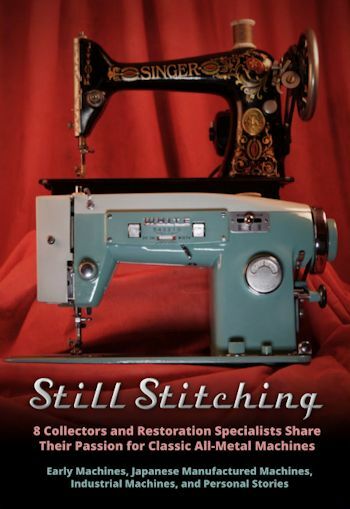 To support a vast array of special stitches, some vintage machines rely on cams. These are discs of varying shapes that insert into the machine to invoke particular movement within the machine to create stitch types. Some manufacturers branded their cams to increase marketing impact. 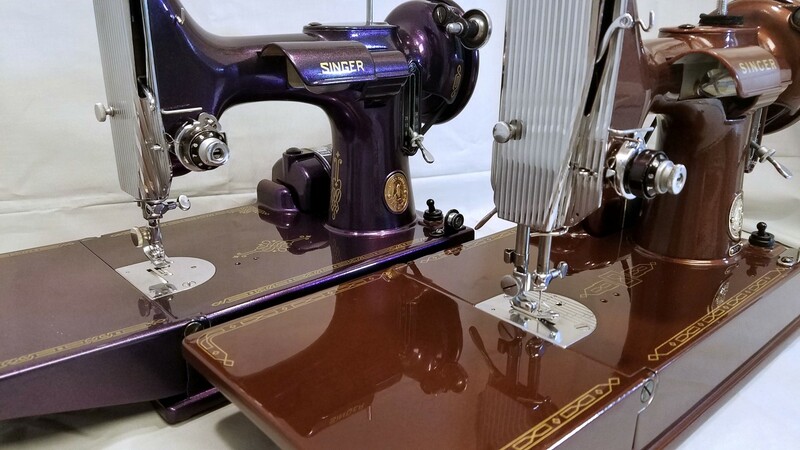 Singer termed some of its cams as Fashion Discs and Flexi-Stitch Pattern cams, and Elna dubbed their cam system as Elnagraph Brain. While many machines used cams, the Singer 500A "Rocketeer" and the Elna Supermatic are machines that often come to mind for their cam systems. Oh boy. This term can stir a hornet's nest among some VSM collectors - for more reasons than one. Foremost, remember above we discussed "badged" machines, manufactured in Japan and based on the Singer 15? Many have come to refer to the Japanese-manufactured machines as clones. The first thing to keep in mind is that at the very least, when you use the term clone, other collectors will typically know what you mean - a Japanese-manufactured machine from the 1950s and 1960s. The second thing to keep in mind is that some collectors and historians take serious issue with the term clone, contending that it diminishes the Japanese industry's role in expanding the sewing machine market and ultimately innovating and advancing engineering and features. For some the word clone suggests something less authentic than the original, and this is sometimes construed as an insult to the Japanese people behind the production of their machines - machines which are well-established as being finely engineered. The third consideration regarding clones is the ultimate negative impact they had on the American sewing machine industry. 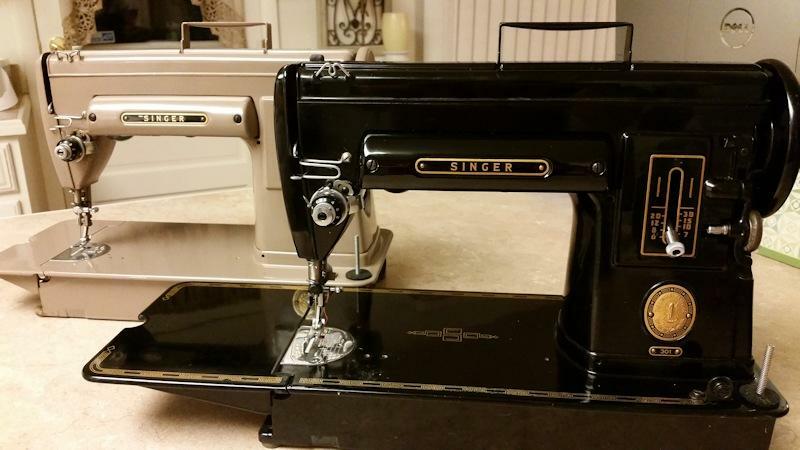 Following the devastation of the war, America took measures to help Japan rebuild their nation, including encouraging the Japanese manufacturing industry to provide sewing machines based on Singer's decades-old, tried and true workhorse, the model 15. Japan then captured a huge portion of the market through badging well-built, affordable machines styled to the American aesthetic of the times. Those that lament the consolidation of American machine manufacturers (and the demise of many) suggest that America essentially handed her once-thriving sewing machine industry over to Japan. 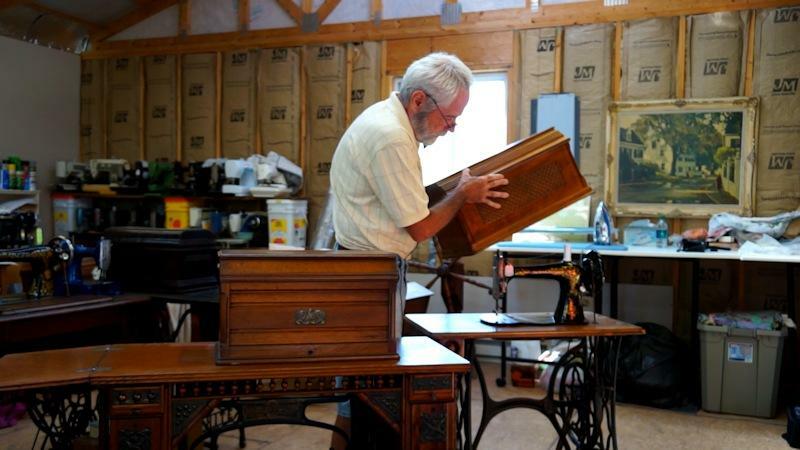 Some cabinet and treadle models have lids that are not attached or hinged to the cabinet. They lift off and have the general appearance of a coffin. 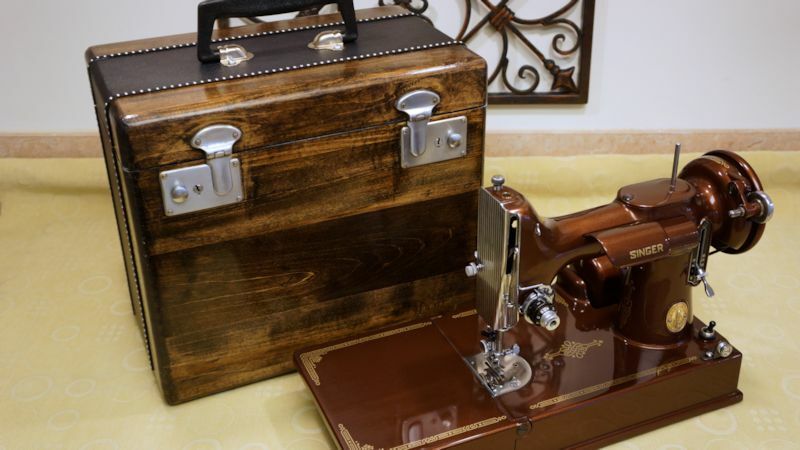 A domestic sewing machine is one intended for the home. This is contrasted to an industrial machine. In recent years, all-metal vintage domestic machines have been frequently and falsely termed as "industrial" or "industrial strength." 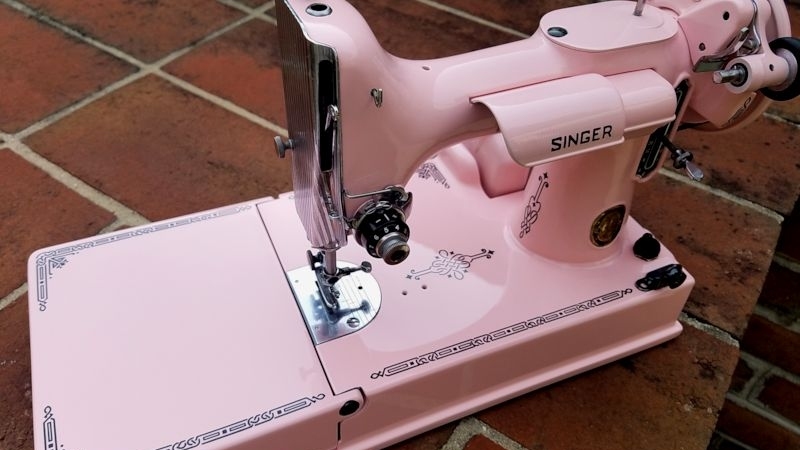 This is simply because they are indeed stronger than contemporary low-cost sewing machines, they are heavy metal, and compared to the sleek plastic designs of today, vintage machines do often have a somewhat industrial appearance. Some enthusiasts seek and prefer true industrial vintage machines, using them for heavy commercial work, sewing leather, specific tasks, or simply because they like the speed and power. But most of us collect domestic VSMs. Bear in mind also that there was a Domestic brand of sewing machine. VSM collecting tends to become downright addictive. Owning dozens isn't uncommon. An "enabler" is someone who avidly supports your addiction to VSMs by pointing out machines that are for sale and encouraging the community to add to our collections. Spouses are often considered enablers if they support the purchase of machines without protesting or cautioning their spouse. 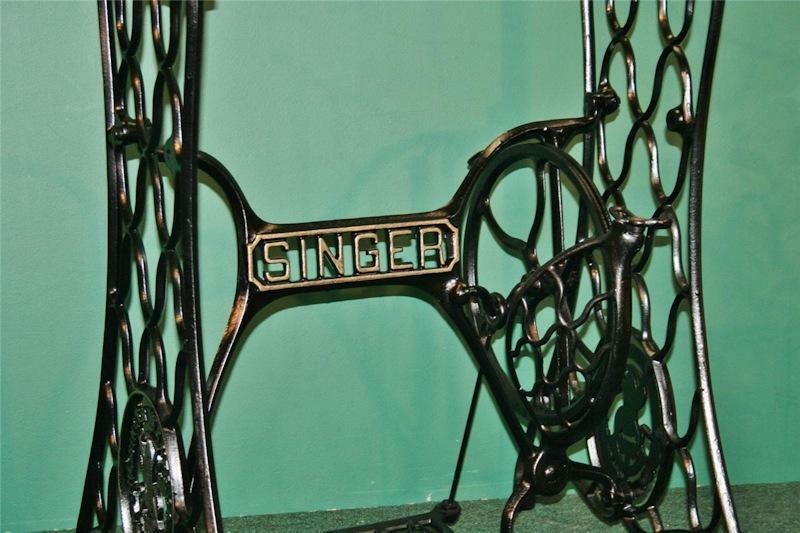 Some early Singer models, like the Singer 12, featured a fiddle base, resembling the musical instrument's shape. The elegant curving machine bed reflected the Victorian era and is often sought by collectors. A gifted machine is one that was given to you for free. So gifted can be an adjective or the past tense of the verb gift: to give someone a machine. Reading and hearing about other collectors' gifted machines has been known to incite rage and heartbreak in those unfortunate collectors who have yet to be so lucky - just kidding, most of us in the community love to hear about how your spouse's coworker's neighbor's cousin gave you an immaculate Elna Grasshopper. While a more technical term would be "crinkle finish," most collectors are nonetheless familiar with the term Godzilla. The dull graphite-to-black crinkle-finished Singers are often described to have the Godzilla finish, presumably due to the resemblance of the dry, crinkled flesh of the fantasy creature by the same name, plus the generally tough look of the finish as opposed to the glossy appearance of most domestic machines. 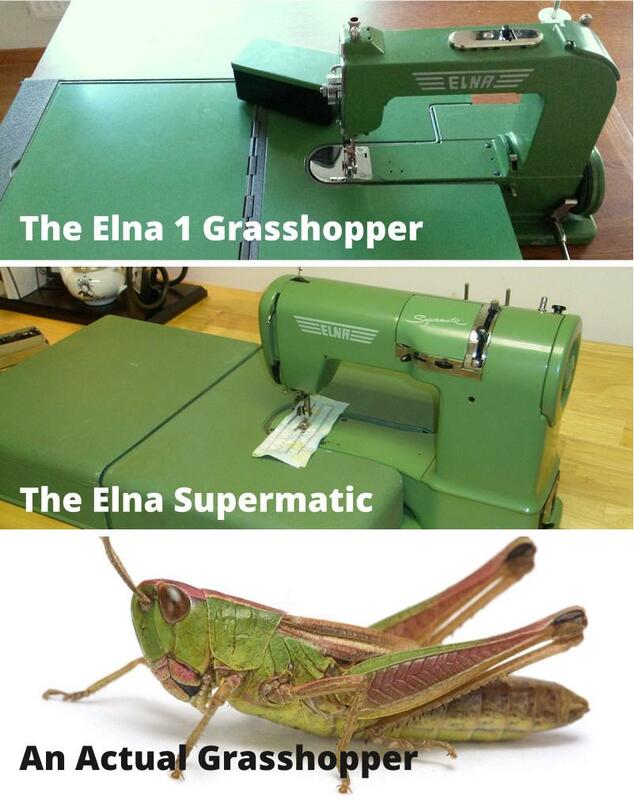 A few machines have memorable names unrelated to sewing, and the Elna Grasshopper is one of the more noteworthy monikers so familiar in VSM vernacular. The coveted, vivid green Elna 1 is known as the Grasshopper. Keep in mind that the Elna Supermatic is also the bright green color, but only the distinctively-shaped Elna 1 is an actual Grasshopper. Both the Grasshopper and the Supermatic share an interesting feature: the machines' cases fold into a sewing surface. 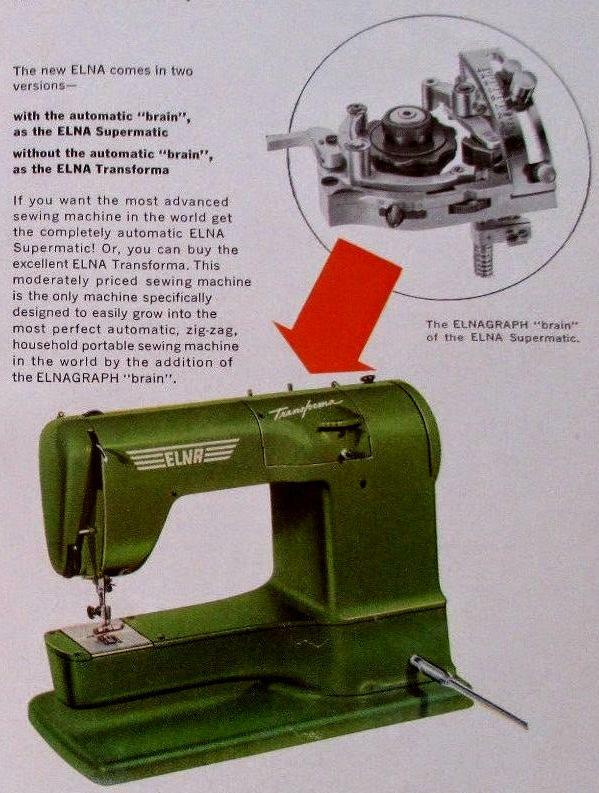 The shape of the Elna 1, appearing perched over its sewing surface, plus it's long leg-like knee bar, may have contributed to its name. 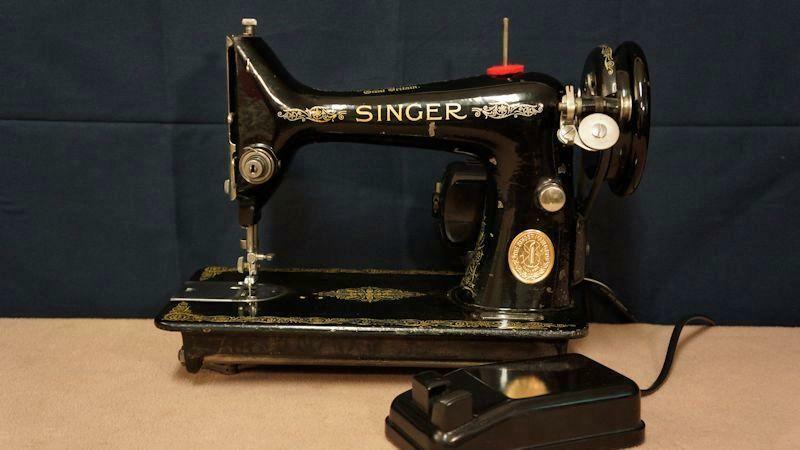 The first generation of Japanese-manufactured Singer 15 clones were HA1 model machines. In our film Still Stitching, collector and historian Will McCann tells us that the very first were manufactured by a company dubbed "Happy." 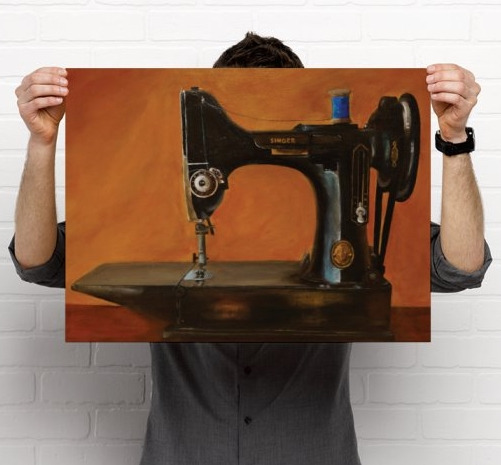 You likely know that the oldest domestic sewing machines were human-powered - either treadle or hand crank. What some new enthusiasts may not know is that many machines can be converted to hand cranks using newly-manufactured conversion kits. 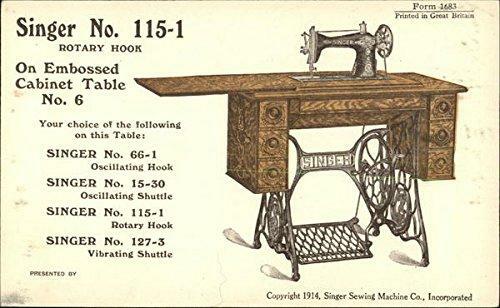 Neither a hand crank nor a treadle machine requires electricity, but a hand crank machine in a carrying case is at least portable, although heavy. 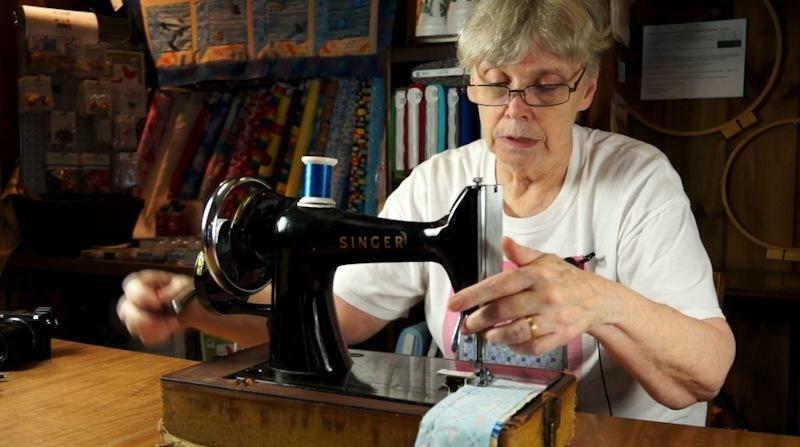 You can take a hand crank machine to a rustic cabin far from civilization and sew until the sun sets or the midnight oil burns out. 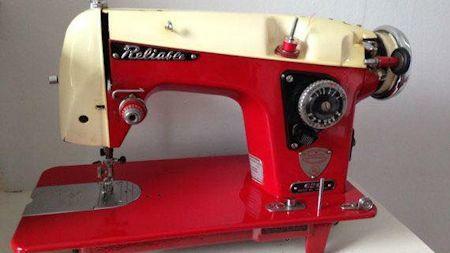 Some corners of the world rely on hand crank machines due to a lack of access to power. Hand cranks are also used by some to teach children to sew. The hand crank allows children to more safely control their speed, better understand the cause and effect of the process, and enhance their coordination and concentration. 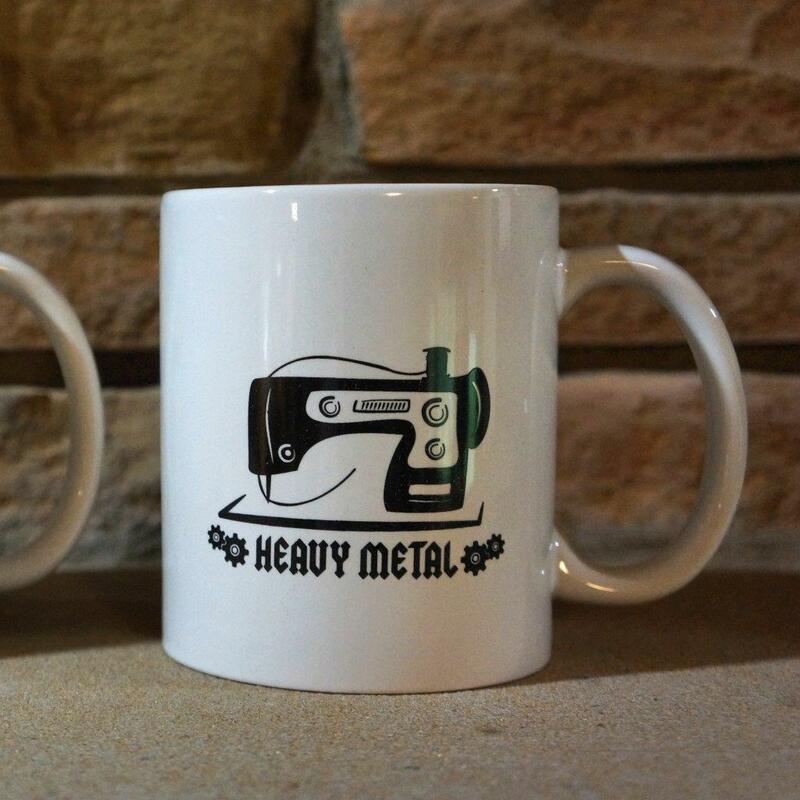 Earlier we mentioned that vintage all-metal machines are sometimes mistakenly referred to as "industrial." Truly industrial machines were - and are - engineered and manufactured for demanding commercial use or industry-specific functions. They often perform specific functions or stitch types and may have especially strong motors and "punching power" to sew through heavy materials like leather. 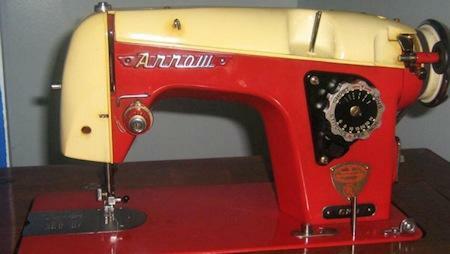 Enjoy this video explaining more about industrial sewing machines. 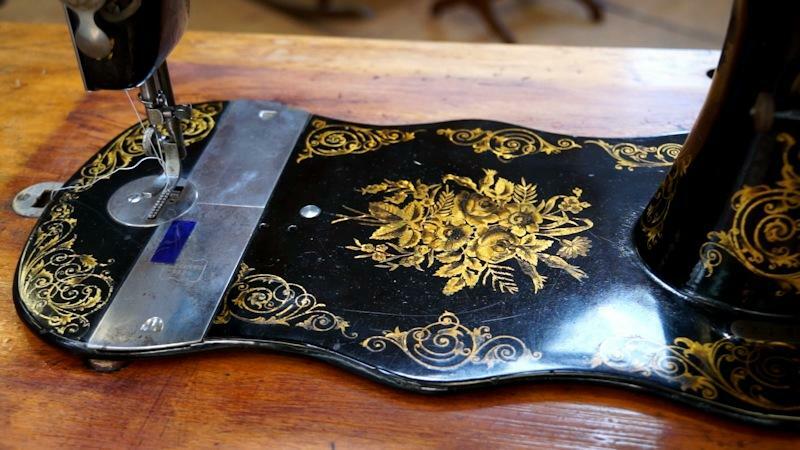 The term irons simply refers to the legs and rocking pedal of a treadle sewing machine, which are often ornate and intricate in their cast-iron designs. 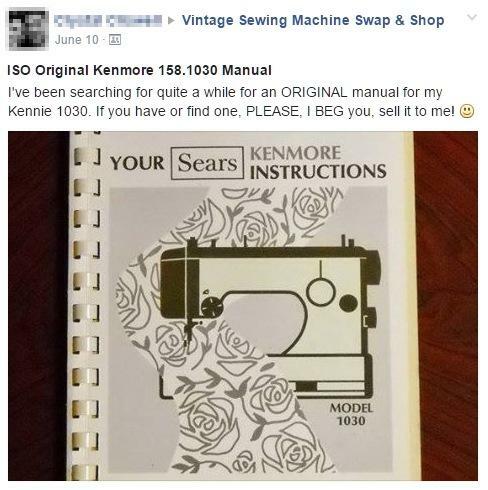 ISO is shorthand for In Search Of - a common term for many sites and online communities, such as buy/sell groups. VSM communities use the abbreviation frequently. This sounds like it would refer to the colorful finishes on Japanese-manufactured machines, but no! Japan is actually a baked on finish on many of the classic black models. It is essentially a quick-dry lacquer or varnish suitable for volume manufacturing of metal goods. The words japan and japanning are the result of the finishing technique having been popular with Japanese crafted items. 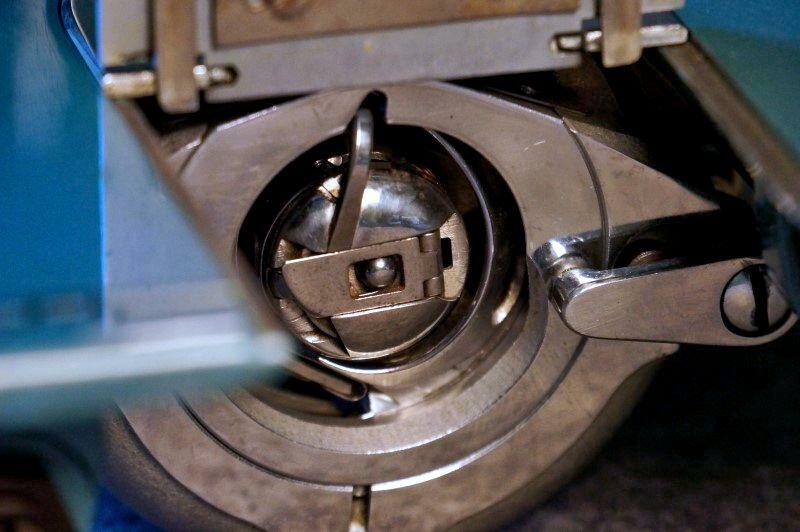 In the photo below, we see an array of Singer machines being dipped into the japanning lacquer. 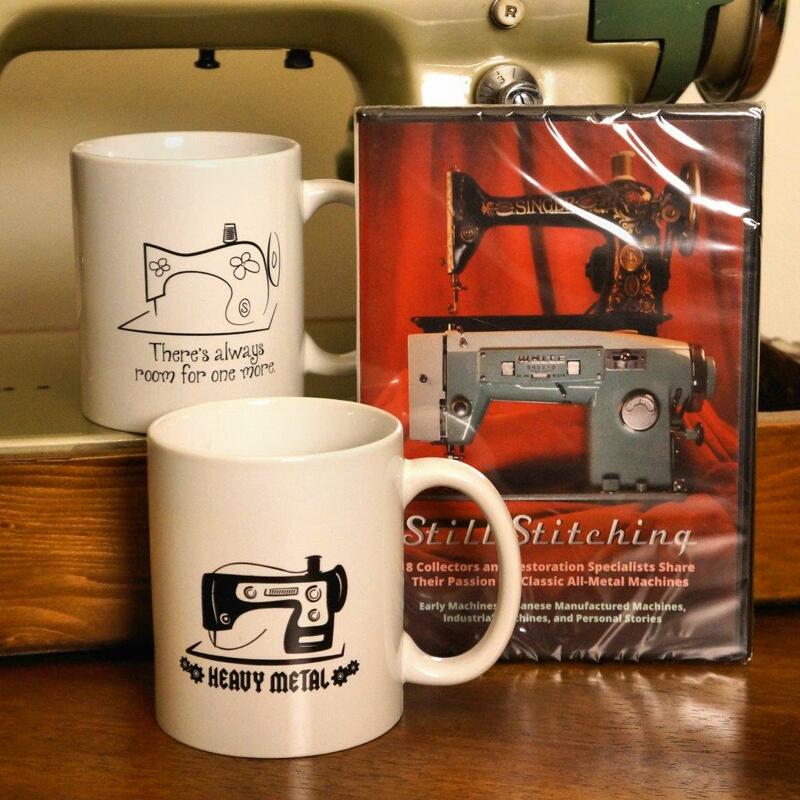 This is from a scene in the historic Singer film, Birth of a Sewing Machine, which you can watch on this page. 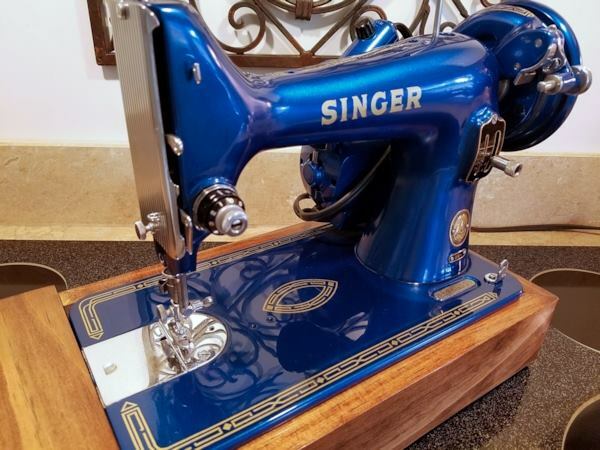 I know of only one machine sometimes called a little sister, and that is the Singer 99 which is a 3/4 sized machine sharing features with the full-sized Singer 66. So the 99 is the little sister of the 66. 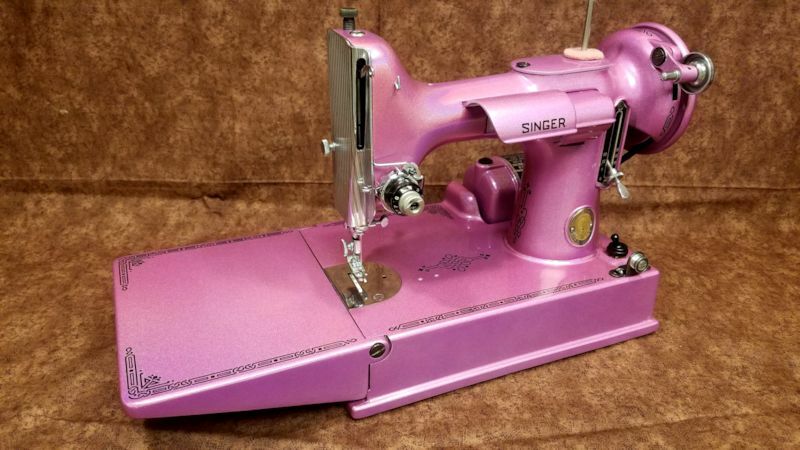 Oddly, while the Singer 301 is often called the "big sister" to the Singer 221 Featherweight, the reference seems rarely reciprocated; meaning, the Featherweight is not typically termed the "little sister" of the 301. Similarly, while the Singer 99 has been dubbed a "little sister" to the 66, I've never noticed the 66 referenced as a "big sister." 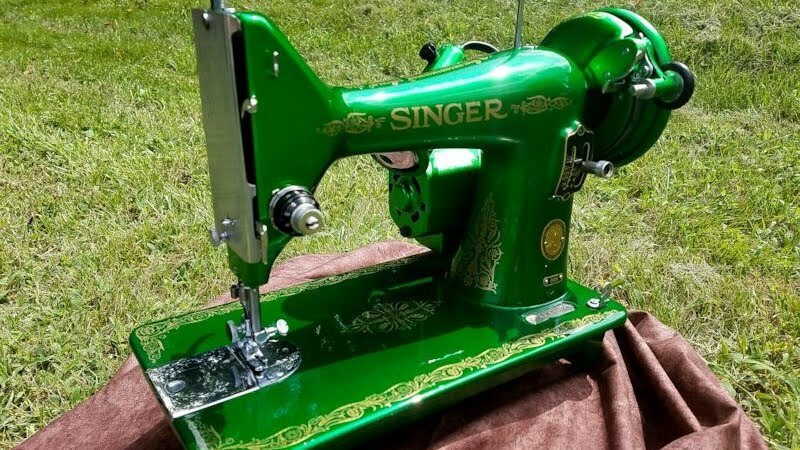 As a 3/4 sized little sister to the Singer 66, the Singer 99 is a nice alternative to the Featherweight for custom paint. The 99's small size contributes to a similar "cute factor." At Still Stitching, our price for a 99 paint job is lower than a Featherweight. 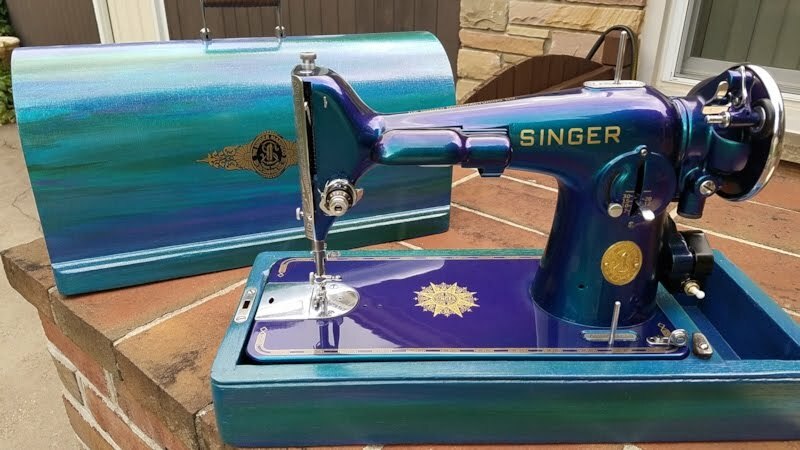 A custom painted Singer 99. 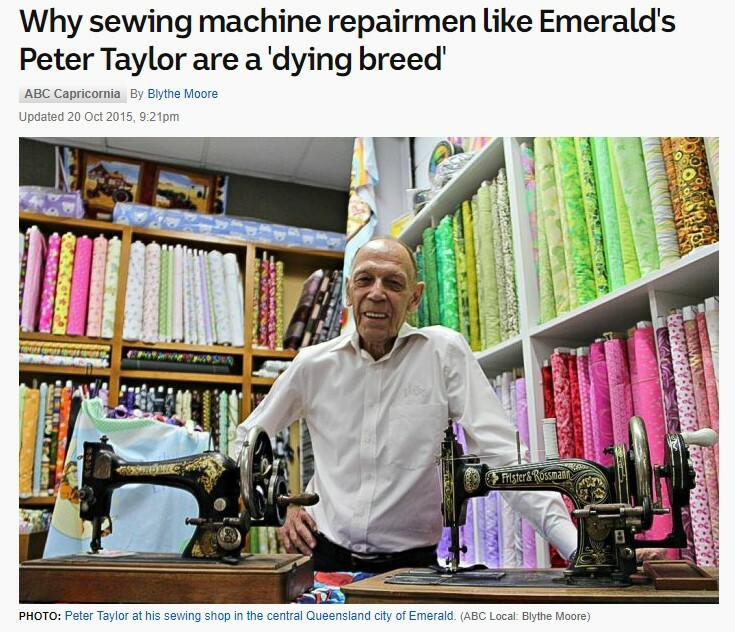 Old sewing machine guy. Or gal, perhaps. 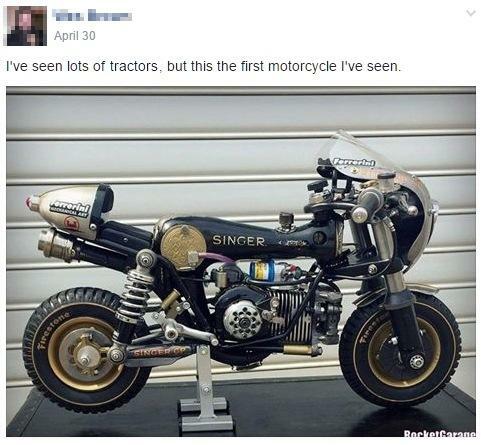 This is a reference to old-school repair and sales professionals - the ones who have been around long enough to have worked on vintage machines when they weren't so vintage. Screen grab of an article on Peter Taylor, OSMG. While there are many parts to a sewing machine, the hook is important to understand. The hook type is also referenced in terms of it being the bobbin driver design type. The hook catches the thread from the needle. The oscillating hook type oscillates back and forth to pick up the upper thread from the needle then pull it down. The hook then reverses its direction. This oscillating movement is a major distinction as related to the rotary hook and the vibrating shuttle design, both covered later in this article. A familiar use of the oscillating hook is the Singer 15 and its many clones, to the extent that the bobbins are referred to as "class 15." You may see references to parting out machines in the online VSM community. This means that the owner has decided to disassemble components of the machine, or the entire machine, to offer these parts for sale. In some cases, a seller can make more money with the parts of the machine than by selling the entire machine. 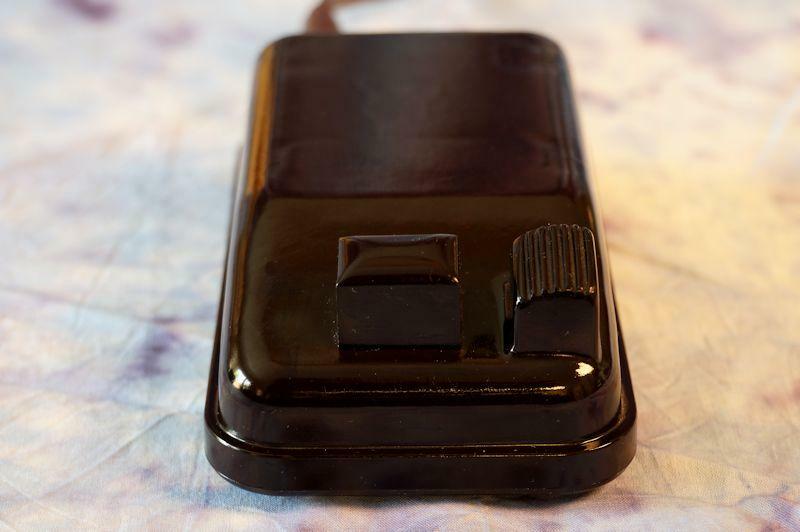 Imagine a Singer Fashion Mate 237 that is a common thrift store item for as little as $10, and it has a flawless bakelite foot control pedal. The owner might be able to get all of her money back selling the foot pedal alone, then sell other parts to ultimately make a profit. 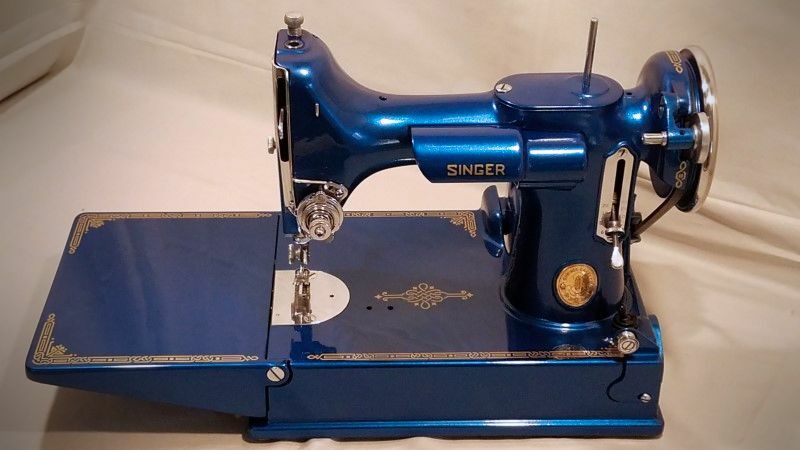 If a Singer 221 Featherweight is discovered in the basement with a cracked aluminum bed and all parts otherwise intact, the owner could make $50 for the bobbin case alone, then sell off the remaining parts. But money isn't the only motivation when parting out machines. Some community members remove parts from a machine simply because they have so many of a particular model that they can "spare" a part for another VSM collector. Others cannibalize a machine in poor cosmetic condition in order to complete a machine that has a better finish, decals, and overall appearance. 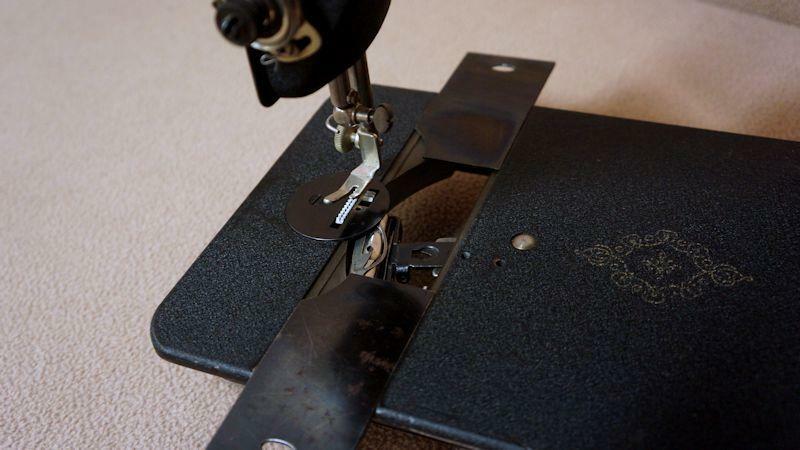 This original Singer special presser foot allows stable control when stitching fabrics that would otherwise slip or complicate the stitching process. It is often associated with the Featherweight. Due to its black color, upright design, and somewhat rocking up-and-down motion, it is known as a penguin. While it originally retailed for just a few dollars, this item can be difficult to locate and can appear for sale for hundreds of dollars. Scoring an original penguin walking foot for a few bucks is like finding a unicorn in your back yard - actually better, because while unicorns do not exist, penguins have been purchased for less than the cost of a candy bar. Pin rash is an array of scrapes and scratches on a sewing machine where an owner has used cloth wrapped around the machine for holding pins. It is considered unfortunate by many collectors since it diminishes the cosmetics of the machine. Meanwhile some enthusiasts consider pin rash to be a reflection of the machine's glory days when it was used frequently as a vital home appliance and not a collector's item. You decide... does pin rash add character? A potted motor is gear-driven as opposed to a belt-driven motor. It integrates into the machine in a more aesthetic manner than an external belted motor and is considered "internal" to the machine. Relying on gears, it is typically thought to be more powerful than a belted motor since the delivery of power is more direct and belt slippage is never a problem. Maintenance and corrective action for potted motors may seem a bit involved to casual collectors, and they are often more expensive to replace than external motors. A "reciprocating shuttle" swings in a slight arc back and forth, as opposed to other shuttle types which utilize a partial or full circulating rotation. VSM enthusiasts who do not sell machines as a business or ongoing side venture will often speak of the need to "rehome" machines. The definition is obvious, perhaps: find another home for the machine or machines. This may be a familiar term, meaning to adapt an item for a new and different purpose. 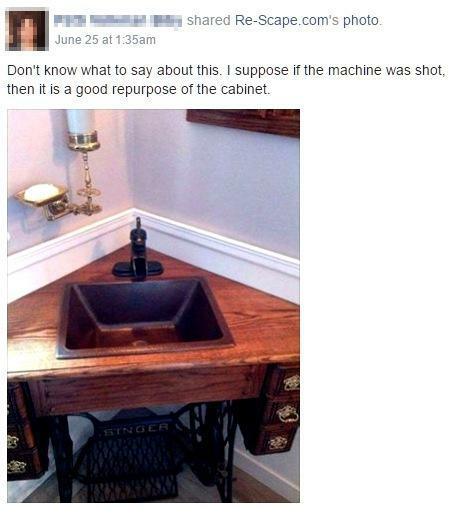 Repurposing sewing machines, cabinets, and irons has been known to cause the sky to darken, rumble, and crack open violently, allowing angry locus swarms to descend upon us from the heavens. 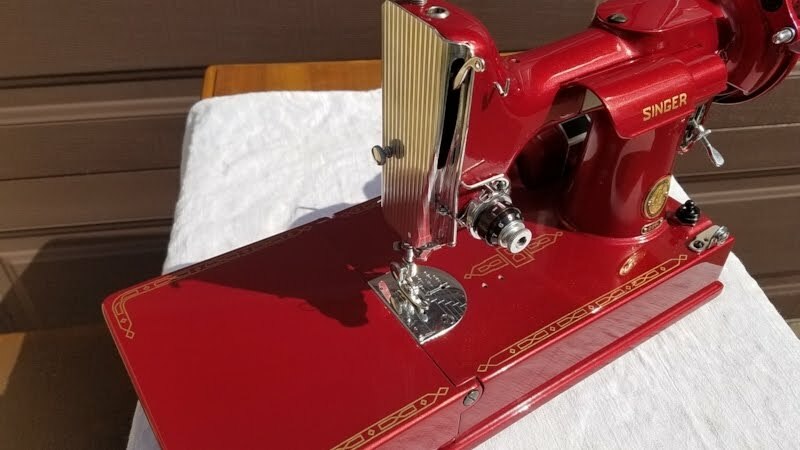 In other words, many VSM collectors can become quite incensed and even emotional about witnessing repurposed vintage sewing machines. 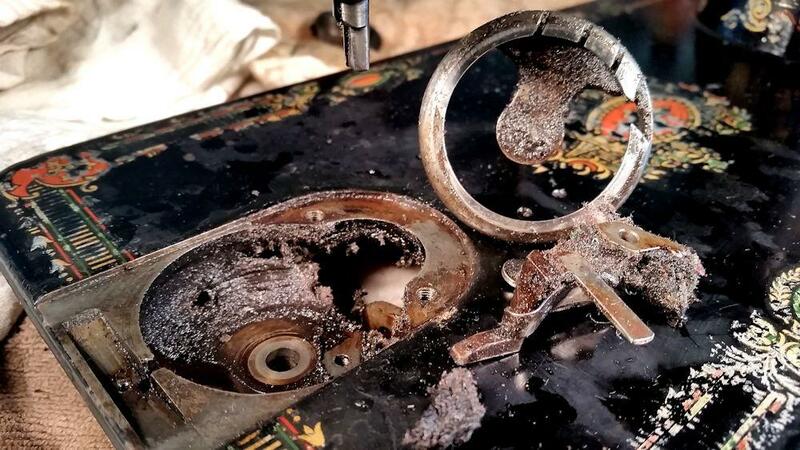 The general consensus seems to be that only irreparable sewing machines should be repurposed, but the funny thing is that even some of the most rusted, crusty locked-up machines can be raised from the dead, overhauled, painted, and have their original purpose renewed. 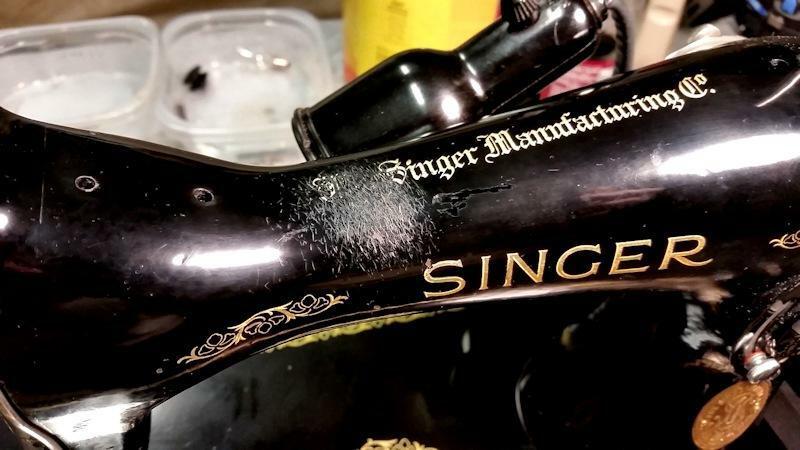 Meanwhile, many will argue that there were so many machines manufactured in the Singer product line that a repurposed machine is no great loss. Then the tongue lashings ensue. Earlier we discussed the oscillating hook, and later we'll discuss the vibrating shuttle. The rotary hook is a hook type that rotates continuously around a stationary bobbin and is often considered more powerful and smoother than an oscillating hook, causing less vibration. New VSM enthusiasts frequently feel a little embarrassed to ask "what is SMO?" when they see the acronym used so often online. Never be embarrassed to ask anything! Even the most knowledgable expert had to first learn the term SMO - sewing machine oil. While we're on the topic, always use quality SMO to lubricate your machine. Other oily penetrating fluids are fine for cleaning, but when you are ready to properly lubricate your machine for peak performance, use SMO. If it doesn't say it's for sewing machines, you should probably avoid it as daily lubricant. 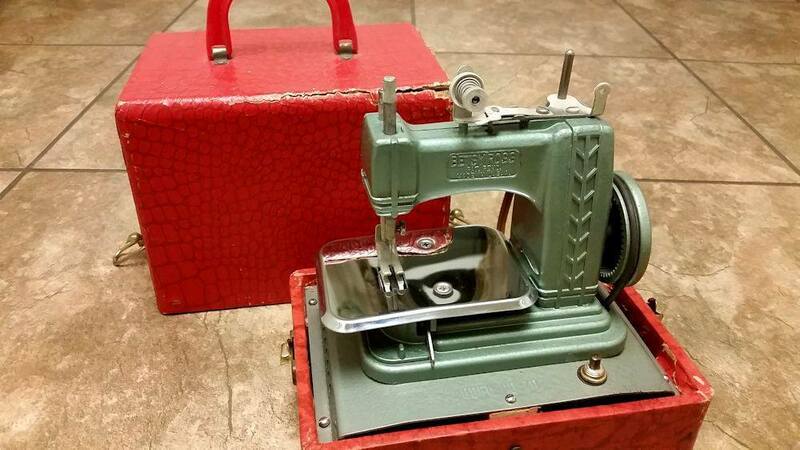 If you hear VSM enthusiasts speaking of a spa day, they probably don't mean a day of facial peels and massages - they are referring to an intensive cleaning and maintenance of their vintage sewing machine. Please don't give your sewing machine a mud pack. New acquisitions are often in need of a spa day after sitting dormant and dusty for a long time. 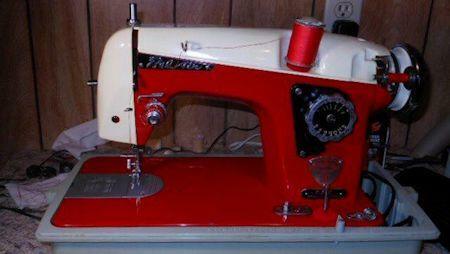 Toys are vintage and often working sewing machines designed for children and/or novelty. Many enthusiasts collect vintage toys as well as full-sized machines. A transverse shuttle is a reciprocating shuttle design that swings left-to-right (in relation to the operator facing the machine while sewing). This is different from a vibrating shuttle, which swings through an arc that travels away from, then back toward, the operator. 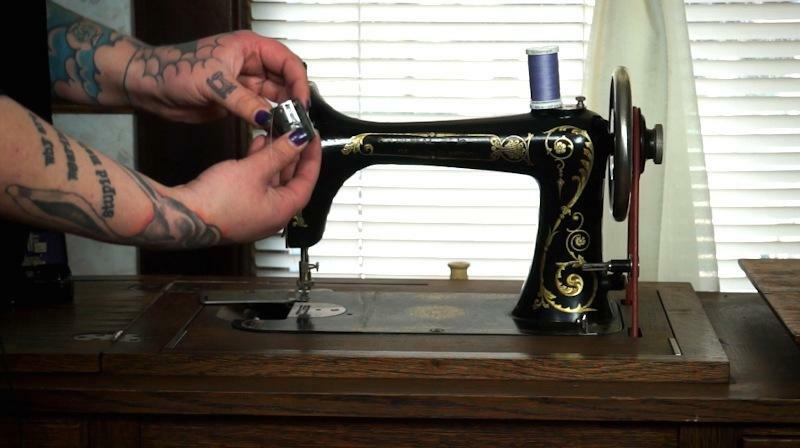 I have to assume that even the newest VSM enthusiast knows that a treadle design is a human-powered sewing machine. The operator uses her foot or feet to rock a large platform-style pedal to transfer power and motion to the sewing machine. The real reason I'm including this term is because it seems to be upsetting to many collectors when the word is mispronounced or misspelled. 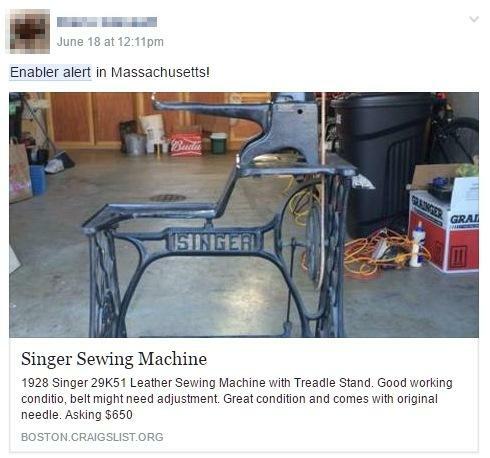 Treadle sounds like pedal, never "tree-dal." And watch your spelling - T-R-E-A-D-L-E - or suffer the wrath of all those grammarians who also collect VSMs. You've been warned. When I first heard this term I imagined two spool pins on top of a machine, each with thread feeding into a special stitching or embroidery system. 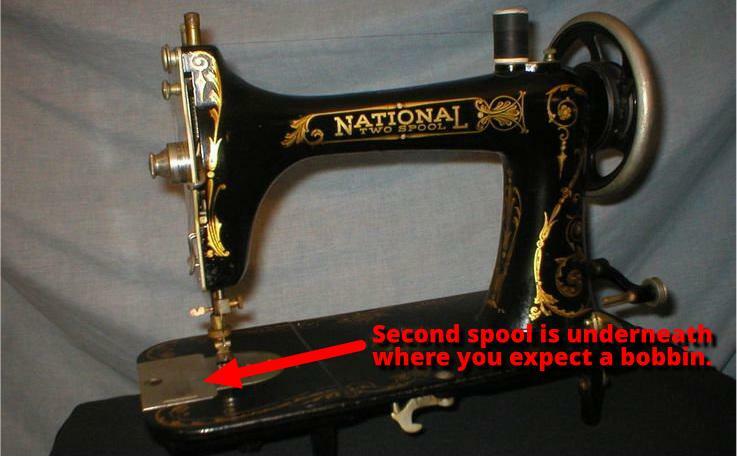 Actually, two spool machines were manufactured by the National Sewing Machine Company, beginning in the early 1900s. These machines feature a "spool can" in place of a bobbin, allowing an entire spool to serve as the lower source of thread. Nifty! Vibrating shuttle machines "vibrate" the shuttle in a path of travel that is a short arc. The bobbin is bullet-shaped and has a pointy tip sometimes referenced as the hook. This shuttle design was replaced by the stronger, smoother rotary hook. The Singer 128 below has a vibrating shuttle. Notice the throat plates are long to allow access to the shuttle, and they slide open toward the operator and away from the operator. It is not uncommon to find machines missing the plate on the side of the operator. With use, they became loose and could easily fall out when the machine was handled. Are there more terms that should be in this jargon glossary? Comment below. What about the Transverse bobbin? This is like the bullet shaped bobbin, but moves from side to side. I have it on a Stoewer VSM. Perfect! Excellent suggestion and we will add it. Thank you so much!